Reference number for this case: 5-nov-54-Yronde. Thank you for including this reference number in any correspondence with me regarding this case. Towards 1954 or 1956, in the summer, at 3 o'clock in the afternoon approximately, Mr DLV (does not want publicity, he never spoke about it so far) is on the slopes of the castle of Buron, located at 4 km of Coudes, in the north of Issoire - 63, more exactly halfway in straight line between the castle and the Allier river. It is a Thursday; like his comrades, he takes part in a play of patronage: a camp had taken position at the foot of the castle which it is charged to defend, the other camp whose witnesses were par of, goes to attack the castle. So a half-dozen of children climb the path and look towards the castle, on their right. Suddenly, they stop short, amazed, at 25 or 30 meters, two characters measuring 0,90 to 1 meter approximately, are busy with an out of the ordinary work in this little attended place. They are dressed with a shining silver plated diving-suit. Their head is wrapped in an enormous helmet. Of 50 centimetres diameter approximately, this helmet is equipped with a circular visor punt (with the manner of an English helmet, but broader), the helmet seems of comparable nature than the diving-suit. The witness will not distinguish a face, a reflection is at this place, a little more shining that the remainder of the diving-suit is his only memory. Close to the two dwarves, is a rectangular case without lid, it seems to be made of the same matter than the diving-suits. The characters take stones on a collapsed section of a wall made of dry stones (common basalt in the area). The stones which they choose could weigh between 1 and 2 kg, they take them with two hands, take some steps, deposit them in the case while bending (without folding the lower members) and return to the stone heap. To this fantastic vision, the fact is added that the characters are moving very slowly. A little as if they were subjected to gravity difficulties to support for them, "as in a film in slow motion" specifies the witness. After two minutes of observation approximately, one of the young boys is seized with fear and flees, the others to follow immediately. Mr DLV cannot specify if an external force prevented him to approach, if it were not is amazement, they felt nothing and the dwarves did not see them.The witnesses did not see an apparatus on the ground, nor in the sky, it is true that the meadow which was the scene of this strange deeds was bordered of thickets. After 12 or 14 years, we found the exact place of the observation (although a little leafier), we took two photographs and took two samples on the collapsed wall. This magazine indicates that on November 5, 1954, in Buron-Yronde, two characters were seen picking up stones. An investigation was done by M. Eyraud, the report was publish in "Lumières Dans la Nuit" #98. The magazine located the department as "54 or 56", probably because of the error on the name of the locality which is Yronde-et-Buron and not Buron-Yronde. Lumieres dans la Nuit (LDLN) #98, February 2, 1969. Investigation by B. Eraud: M. DLV tells of an event that occurred on a summer afternoon in 1954 or 1956 (sic). He was with a group of children on the slopes of the Chateau de Baron [sic], Puy-de-Dome, when they came upon two "personages" dressed in shiny silvery diving suits, their heads covered with enormous, helmets with wide circular visors. The two were taking stones from a broken drystone wall and putting them into a rectangular box that seemed to be made of the same material as their suits and helmets. They moved slowly and stiffly, "like a slow motion film," carrying the 1 or 2 kg hunks of native basalt in front of them with both hands. M. DLV and the children watched unobserved for about 2 minutes then turned and fled. They saw no machine in the air or on the ground, although one could have been hidden behind the bushes that surrounded the field. The witness, Monsieur D.L.V., is not anxious for publicity, and has never spoken to anyone about this episode until quite recently, when he gave the details to me. At about 3.00 p.m. one Thursday in the summer around about 1954-1956 he was on the slopes beneath the chateau of Buron, which is 4 kilometres from Coudes. With his companions, Monsieur V. - then a boy - was taking part in a young people's outing. One group of them had installed themselves below the castle, which they were "defending", while the other group, to which the witness belonged, was "attacking". Half-a-dozen of them are moving along up a path and looking towards the castle, which is on their right. Suddenly, dumbfounded, they freeze in their tracks. Just ahead of them, at a distance of no more than 25 or 30 metres, are two beings about 90 centimetres or 1 metre in height. They are wearing bright shiny "divers' suits", and their heads are encased in enormous helmets about 50 centimetres wide. The helmets have a flat circular visor (as on an old style British Tommy's helmet, but wider). The helmets seem to be of the same material as the diver's suit". The witness was able to make out no features; his only recollection is of a reflection of something there, a bit brighter than the rest of the helmet. Near the two dwarfs stood a square box without a lid, seemingly made of the same material as the "divers' suits". The two little beings were taking stones from a section of wall made of stacked unmortared stones (the local basalt, commonly found in the region). The stones they were selecting seemed to be around 1-2 kilogrammes in weight. They were lifting the stones with both hands, carrying them a few paces, and bending down and placing them in the box (without bending their legs) and then returning to the wall for more. To this fantastic sight, add the fact that the beings were moving very slowly, somewhat as though they were subjected to a weight that it was difficult for them to bear. "Just like in a slow-motion film," said the witness. After they had watched for about two minutes, one of the boys was seized with panic and fled, followed immediately by the rest. Monsieur D.L. V. was unable to say whether any force other than astonishment had prevented the boys from approaching more closely. The boys felt nothing, and it is possible that the dwarfs did not see them. The boys saw no machine on the ground or in the air. The meadow which was the setting for the unwanted episode is however bordered with groves of trees. Visiting the site some 12 or 14 years after the alleged occurrence, we found it precisely, though it is rather more overgrown with vegetation now than then. We took two photographs and also some samples from the crumbling wall. NOTE: There is a geological fault-line about 300 metres to the south-west of the site. The two authors indicate that in 1954 or 1956, in the summer, in France, at the Castle of Buron, around 3 p.m., Mr. Div and 6 other children took part in a play of patronage and climbed a pathway between the castle of Buron and the Allier river. At 25 or 30 meters, two small characters, of 90 centimeters to 1 meter height approximately, equipped with brilliant silver plated diving-suits, the head wrapped in an enormous helmet of 50 cm in diameter approximately, of the same matter, provided with a circular visor, were busy on a collapsed section of wall, made of dry stone (basalt). They choose parts from 1 to 2 kg, take them with the two hands, take some steps and deposit them in a case while bending themselves, without folding the legs. Then they return to the wall. They are moving slowly. After two minutes of observation, one of the young boys became afraid and fled. The others follow immediately. The authors indicate that it is a rare case of beings with no UFO and that the source is R. Erthaud in Lumières Dans la Nuit, page 5, #98. French author Jean Sider provides the investigation by Mr. Eyraud, except that he spells "Eraud" and locates the case in 1954 instead of 1954 or 1956. He indicates that the source is LDLN #98 page 5. He reproduces a sketch published in this source, made by Fernand Lagarde called an "illustrated interpretation." Albert Rosales indicates in his catalogue that near Coudes, France, on Summer, 1955, at 1500, D. L. V. then a boy, was beneath the chateau of Buron with several other boys when they saw, no more than 30 yards away, 2 beings about 3 ft tall, wearing bright shiny "diver's suits" and enormous helmets about 18" wide. 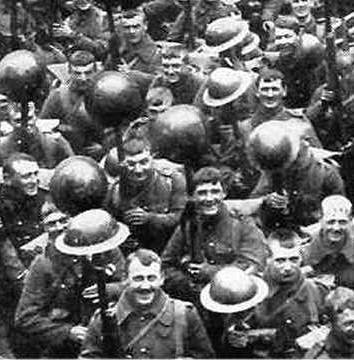 These helmets had flat circular rims, like World War I helmets. No features were visible. Near the dwarfs was a square metallic box without a lid, and they were taking stones from a dry broken dry stone wall and putting them in this box. Their movements were very slow, as though under a heavy weight. The boys watched for about 2 minutes before running away. No UFO was seen. Albert Rosales indicates that the source is R. Eraud, FSR Vol. 4, #6, and Humcat 1955-12. The author indicates that there was a close encounter of the third kind in Coudes in the Puy-de-Dôme, in the summer of 1954 or 1956, at 03:00 p.m.
A "Mr. DLV", who asked for anonymity, and six other children, attended a patronage game, and climbed a path between the Buron Castle and the Allier River. Looking towards the castle on their right, they stopped, stunned, for at 25 or 30 meters from them, there were two small figures, about 0.90 m to 1 meter tall, who were busy on a wall of collapsed dry stones. They were dressed in a brilliant silver suit, their heads wrapped in an enormous helmet about 50 cm in diameter, fitted with a flat circular visor in the manner of English helmets, but wider. This helmet seemed of the same nature as the diving suit. The witnesses did not distinguish the face of these beings, perhaps because of the more accentuated reflection in this place of their person. The two beings took samples of stones that they lifted with the two hands, taking a few steps and depositing them in a crate by bending without folding the lower limbs and then returning to the wall. These beings moved slowly, a little as if they were subjected to a gravity hard to bear for them. After two minutes of observation, one of the young boys became frightened and fled; the others followed immediately. Julien Gonzalez publishes the sketch by Jean Giraud, extracted from the magazine INFO-OVNI, in the special issue "Les humanoïdes", and notes that the witnesses did not see any craft on the ground nor in the sky. The sources are indicated as "Lumières dans la Nuit, #98, page 5 (investigation by Mr. R. Eraud); Michel Figuet and Jean-Louis Ruchon, OVNI.. le premier dossier complet des rencontres rapprochées en France, pages 646-647." We are served with a rather pathetic UFO case here. First of all, there is no UFO. To talk about a "landing " does not make any sense here, and raises the questions of the will to believe of the investigator. Then, I did not find anything certain in connection with the date. Had some investigator simply wished to add this case to the 1954 French lore? How did it happen that the case is dated as of November 5, 1954, by the ones whereas the apparently initial report notes "1954 or 1956 in summer"? We will further see that the summer is probably correct while November is probably invented. What is crystal clear on the other hand is the description by the witness, who was a child at the time of this event. There are odd characters, in white, with helmets, appearing of the same matter as their clothes, the top being described with this very important detail: in the shape of English helmet. There is this box, and these flat things which are put in the box. The investigator, the witness, probably associated these flat things with the stones of the wall, but these flat things were perhaps simply posed against this wall. There is this slow movement of the characters, of which the investigator suggests that it is consequence of the aliens not being accustomed to the terrestrial gravity. The outfit is in conformity. The illustrations below shows the reader that bee-keepers indeed wear on the head an "English helmet", a shape so characteristic and well known thought the imagery of World War 2. They act as bee-keepers would. 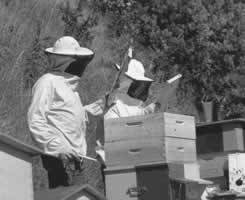 Their slow movements are normal for bee-keepers with their heavy clothing and perhaps carrying bees which are not to be frightened by fast moves. [re1] Investigation by R. Eyraud, personal file. [re1] Article in the ufology magazine Lumières Dans la Nuit (LDLN), France, #98, page 5, February 1968. 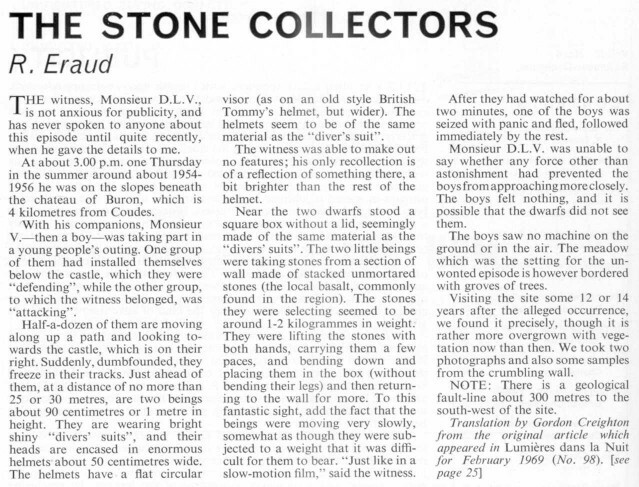 [fs1] "The Stone Collectors", article by R. Eyraud, in the ufology magazine Flying Saucer Review (FSR), U-K., Volume 15, #6, November 1969. [ld1] "Les Archives de 1954 pour le Puy-de-Dôme", article in the ufology magazine Lumières Dans la Nuit, France, #125, page 27, May 1973. [tb1] "New Data on 1954 European Wave and More Recent Foreign Cases", article by Ted Bloecher from sources by Jean-Luc Rivera in the ufology bulletin MUFON Journal, USA, #130, page 16, September 1978. [fr1] "OVNI - Premier Dossier Complet Des Rencontres Rapprochées en France", book by Michel Figuet and Jean-Louis Ruchon, Alain Lefeuvre publisher, France, pp 646-647, 1979. [gz1] "RR3 - Le Dossier des Rencontres du Troisième Type en France", book by Julien Gonzalez, Le Temps Présent publishers, France, pp 64-65, 2014. 0.1 Patrick Gross May 12, 2004 First published. 0.1 Patrick Gross February 11, 2008 Conversion from HTML to XHTML Strict. 1.0 Patrick Gross December 23, 2008 First formal version. Additions [tb1]. 1.1 Patrick Gross December 3, 2011 Addition [fs1]. 1.2 Patrick Gross January 13, 2017 Additions [gz1], [ub1]. This page was last updated on January 13, 2017.